I’m back and today were going over hand placement while performing bicep curls. As with many other exercises, the effectiveness and efficiency of Curls can be altered by your hand positioning. Minor changes in how you grab the bar can have a big effect on the results of the exercise. Knowing how these variations affect your Curl can give you a boost in muscle size and help you better understand how to target them properly. Supinated grip curls work both the short and the long head of the biceps equally. This position is easier to assume on a straight barbell than an Ez-Bar, as the Ez-Bar only allows you to comfortably place your hands either in a close or wide position. Utilizing a shoulder-width grip puts your body in the best position for curling, meaning you’re likely to find it more comfortable than either the close or the wide grip. You’ll also likely be able to curl the most weight while utilizing a standard grip. The reverse curl, the hands are in a pronated grip, meaning your palms are facing down and away from you. This variation will target your forearms and your grip strength much more than a regular curl. Reverse Curls heavily target the brachioradialis, a major muscle in the forearm. By forcing you to tightly hold onto the bar throughout the movement, Reverse Curls are generally a more difficult exercise that bicep curls, so don’t be surprised if you have to use lighter weight. Ez-bar reverse curls can be done with your hands on the outside grip of the bar, which will have your palms turned slightly inward. 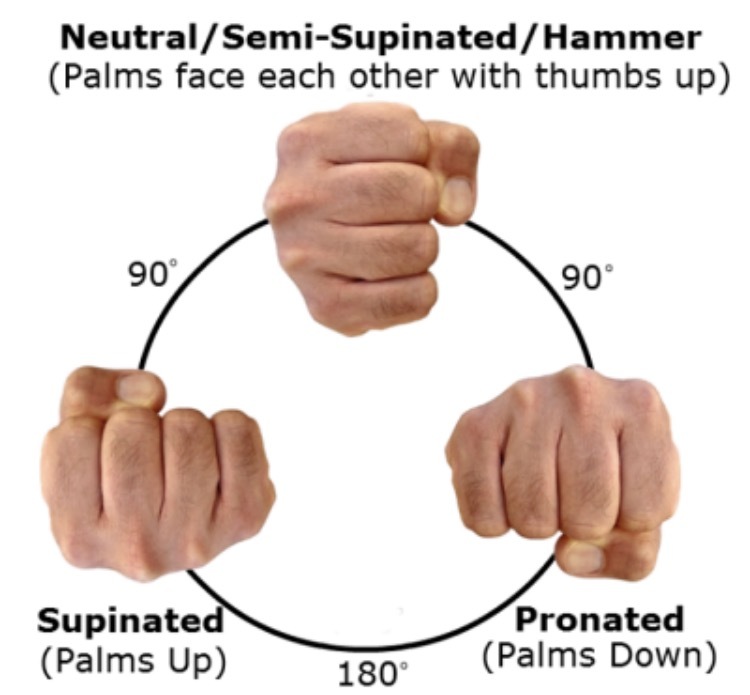 A neutral grip is essentially halfway between a pronated grip and a supinated grip. Instead of your palms facing toward you or away from you, they’re turned in so they’re facing one another. Curling with a neutral grip is commonly known as a “Hammer Curl,” and it’s usually only possible to perform using dumbbells, unless your have specialty bars. Hammer curls get their name because the movement looks similar to swinging a hammer. Hammer curls target both heads of your biceps in addition to your brachioradialis and brachialis (a small muscle in the deep upper arm). That means you’re working both your forearm and upper-arm, making Hammer curls a well-rounded exercise. Additionally, a stronger brachioaradialis and brachialis can actually push your biceps up, making it appear bigger. Hammer curls also place less stress on your wrist than a traditional Bicep Curl (supinated) or Reverse Curl (pronated), making it a smart choice if your looking to avoid stress in that area. Try this Arm Busting workout if you want an insane PUMP!